Is Nvidia Playing Fair With Their New Development Tools? There's some heavy details in all of this, many of them at least somewhat technical, so let's dispense with the typical introductions and get right to the meat of this GPU industry sandwich. It's no secret to anyone paying attention to the video game industry that the graphics processor war has long been primarily waged between rivals Nvidia and AMD. What you may not realize is just how involved those two companies are with the developers that use their cards and tools. It makes sense, of course, that the two primary players in PC GPUs would want to get involved with game developers to make sure their code is optimized for the systems on which they'll be played. That way, gamers end up with games that run well on the cards in their systems, buy more games, buy more GPUs, and everyone is happy. According to AMD, however, Nvidia is attempting to lock out AMD's ability to get involved with developers who use the Nvidia GameWorks toolset, and the results can already be seen on the hottest game of the season thus far. Some as-brief-as-possible background to get things started. First, the GameWorks platform appears to be immensely helpful to developers creating graphically impressive games. Developers license these proprietary Nvidia technologies like TXAA and ShadowWorks to deliver a wide range of realistic graphical enhancements to things like smoke, lighting, and textures. Nvidia engineers typically work closely with the developers on the best execution of their final code. Recent examples of Nvidia GameWorks titles include Batman: Arkham Origins, Assassin's Creed IV: Black Flag, and this week's highly anticipated Watch Dogs. Now, while this is and should be a licensing-revenue win for Nvidia, aspects of the agreement in using GameWorks may actually seek to extend that win into a realm that threatens the larger gaming ecosystem. As mentioned previously, both Nvidia and AMD have traditionally worked extremely closely with developers, even going so far as assisting them in optimizing the game code itself to offer the best experience on their respective cards. How? Well, I'll let PR lead for AMD, Robert Hallock, chime in. "Gameworks represents a clear and present threat to gamers by deliberately crippling performance on AMD products (40% of the market) to widen the margin in favor of NVIDIA products," Hallock told me in an email conversation over the weekend. But wait, it stands to reason that AMD would be miffed over a competitor having the edge when it comes to graphical fidelity and features, right? Hallock explains that the core problem is deeper: "Participation in the Gameworks program often precludes the developer from accepting AMD suggestions that would improve performance directly in the game code—the most desirable form of optimization.The code obfuscation makes it difficult to perform our own after-the-fact driver optimizations, as the characteristics of the game are hidden behind many layers of circuitous and non-obvious routines," Hallock continues. "This change coincides with NVIDIA's decision to remove all public Direct3D code samples from their site in favor of a 'contact us for licensing' page. AMD does not engage in, support, or condone such activities." In other words, the dual symbiotic relationships that have always existed between developers and both Nvidia and AMD becomes one-sided, with AMD being locked out of the process in some very important ways. It means that an essential information repository and communications lines for development and game code optimization nearly become proprietary in favor of Nvidia. And, lest you think one shouldn't simply take the word of a rival PR flack on this kind of thing, other tech journalists appear to not only agree, but have predicted this exact outcome nearly a year ago when the GameWorks program was first rolled out. "AMD is no longer in control of its own performance. While GameWorks doesn't technically lock vendors into Nvidia solutions, a developer that wanted to support both companies equally would have to work with AMD and Nvidia from the beginning of the development cycle to create a vendor-specific code path. It's impossible for AMD to provide a quick after-launch fix. This kind of maneuver ultimately hurts developers in the guise of helping them." Forbes' Jason Evangelho then digs into the title du jour, Watch Dogs, an Ubisoft production developed within the GameWorks platform. When a tech journalist is this surprised by how stark the difference in performance is between two rival GPU manufacturers, it's worth taking him seriously. I've been testing it over the weekend on a variety of newer AMD and Nvidia graphics cards, and the results have been simultaneously fascinating and frustrating. It's evident that Watch Dogs is optimized for Nvidia hardware, but it's staggering just how un-optimized it is on AMD hardware. I guarantee that when the game gets released, a swarm of upset gamers are going to point fingers at AMD for the sub-par performance. Their anger would be misplaced. The graphic above may not appear all that staggering at first, until you understand the cards involved and what it actually represents. The two cards in question aren't remotely in the same category of power and cost when compared to one another. That AMD card that is barely keeping up with the Nvidia card is a $500 workhorse, while the Nvidia card is a mid-range $300 staple of their linecard. Both cards were updated with the latest drivers for Watch Dogs prior to testing. 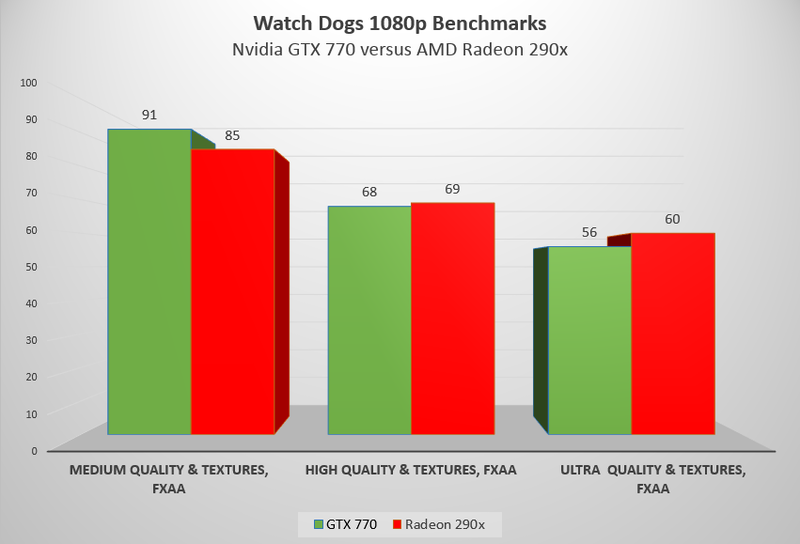 The problem, as suggested above, is that the level of optimization done for the Nvidia cards far outpaces what's been done on AMD's end and it is thanks to the way the GameWorks platform is licensed and controlled. Games outside of that platform, with the exact same cards being tested, tell a far different story. To further put this in perspective, AMD's 290x graphics card performs 51% better than Nvidia's 770 on one of the most demanding PC titles around, Metro: Last Light — which also happens to be an Nvidia optimized title. As you would expect given their respective prices, AMD's flagship 290x can and should blow past Nvidia's 770 and compete with Nvidia's 780Ti on most titles. To really drive the point home, my Radeon 290x can hit 60fps on Metro: Last Light with High quality settings and 4x anti-aliasing, at a higher resolution of 1440p. There's some history here, with Nvidia having a reputation for being more proprietary than AMD, which has always been seen as more of an open-source, open-dialogue, open-competition company. Indeed, Nvidia even has some history with trying to hide colluding with competitors behind trade secret law. But if it's allowed to simply lock up the open dialogue that everyone agrees makes for the best gaming ecosystem all around, the results could be quite poor for the PC gaming community as a whole. Particularly if upset AMD GPU owners who aren't aware of the background end up pointing the fingers at their co-victims of Nvidia rather than the villain itself.